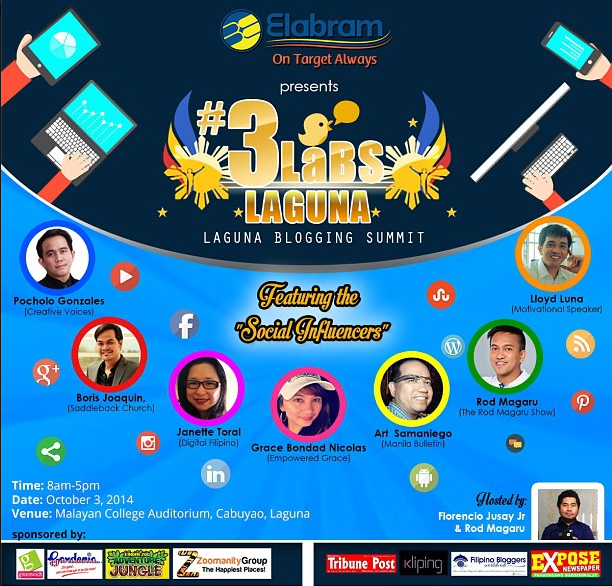 We are inviting everyone who can engage a lot of people for their advocacies not only in Social Media but also offline to attend the 3rd Laguna Blogging Summit. Time: 8 am to 5 pm. Don't miss the event. See you all there. FREE 50 slots for Filipino Bloggers Worldwide (FBW) member who can blog about it using hashtag ‪#‎3LaBS‬ ‪#‎FBW‬ and tagging @rodmagaru on Twitter. Content is just the background of the event and inviting your readers to attend. This should be really interesting even if's somewhere in the south. It's been a while since the last time I hit Laguna. Hope my schedule permits either.